Back to the experiment: Round 3. Over the weekend, I ran 14.5 miles (23.1 km) which is the longest run I have done so far. That’s a half marathon and a few. My wife was with me but she did only 11 miles (17.6) and did great. I think I surprised her when I said that I was going 3.0 more miles as we headed back to the car. She did not object or discouraged me,but there was still a worried look in her face as I picked up my pace. I just want to take advantage of my one-week chemo holiday and log as much miles as I can. Plus, it is such a beautiful day to waste. Now, I go back to treatment or back to the gerbil wheel. It will be another long day. I can’t complain; so far I have been responding to my treatment, manage to keep training, and enjoy each day that is given. That is the secret: you take what is given and enjoy the moment. Similarly, I have had bad days but if you only hold on longer the moment will pass and things will be ok. Like running, there are times my legs refuse to take me the distance. Or my body just could not get up early to go the gym. These type of days are needed to balance things out, otherwise you don’t get to appreciate the good side. Today, I will see Sammy again, along with Saray, Sonia, and others. I will sit in the waiting room and hear the interesting stories of my “friends”. I will get infused and take it all in with open arms. I will try to recover fast, shake it off, and set my mind for this weekend where I will be on the starting line for a half-marathon. 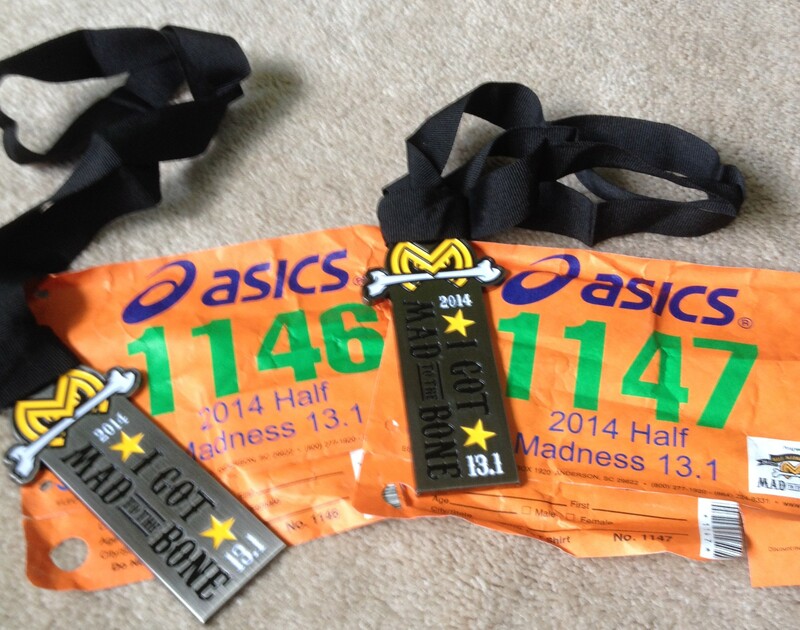 With my chemo and training the race is appropriately called Half Madness 13.1: Mad to the Bone (It should have been called pure madness in my case). Yes! Round 2 starts tomorrow. Will be early again and will stay at the hospital the whole day. Let see what surprise is in store for this lab rat. “Hi, Mr. Alvarez. My name is Sammy and I will be your clinical nurse for the research.” Reality hit me that I am now going to start a new phase in finding a cure for my cancer. My mind was pre-occupied by the events leading to this moment. Earlier that day. The clock reads 4:30 am and I am awake. I need to get to the hospital before 7:00 am and it is a 20-mile drive from my house. It is normally an easy drive but you have to pass through downtown to get from the north side, where I live, to the south side of Chicago. I use to have a habit of going to the gym first before going for my chemo sessions but I don’t have time. After a quick shower and breakfast, my wife and I leave for UofC Medicine. We get there early but there are already other patients in the waiting area. They look at ease with their surroundings, while I take in all the new environment. Some patients in the waiting area are wearing protective masks, others are pale, glassy-eyed, no hair, and just look unhealthy. I know that look. Each of us have their own state of mortal temporariness; each, also, prefer not to be in this situation. “So, Mr. Alvarez, today you will be having this new treatment.” Sammy started to explain. I was given a room with a bed after checked my vital signs and weight. The staff is very efficient and courteous, like Sammy. I learned later he is from Ghana and has been with the hospital for 16 years. I am in safe hands. “Yes.” I replied with a little anxiety in my voice. This is a new experience for me: a human guinea pig. I am participant Number 5. Previous to this, the drug was only tested in mice and monkeys. I suppose there is always the first time for anybody and it is too late to back out now. Assisting Sammy is Saray, a sweet and motherly clinical technician, who tells me her son’s birthday is exactly like mine. She has contagious smile. She started with the EKG (the first of several) test, then proceeded to insert an IV line in my arm to get all the blood they would need during the treatment. My port, located in my chest, was also accessed and with that we were ready. Sammy started me off with three-drug “happy cocktail” combination, which is familiar to me. The cocktail includes: Benadryl to put me to sleep, steroids to prevent any allergic reaction, and Pepcid to settle my stomach or more like to prevent vomiting. I felt the effect of Benadryl lulling me to sleep but I held off to experience the first few drops of the trial drug. As I took in the drug my senses were primed to any allergic reaction from the drug. My wife holding my hands, looked for any changes in me like rash or discomfort. My vital signs stayed normal as the minutes ticked by and finally I was out. I was aware of my surrounding but too groggy to wake up. 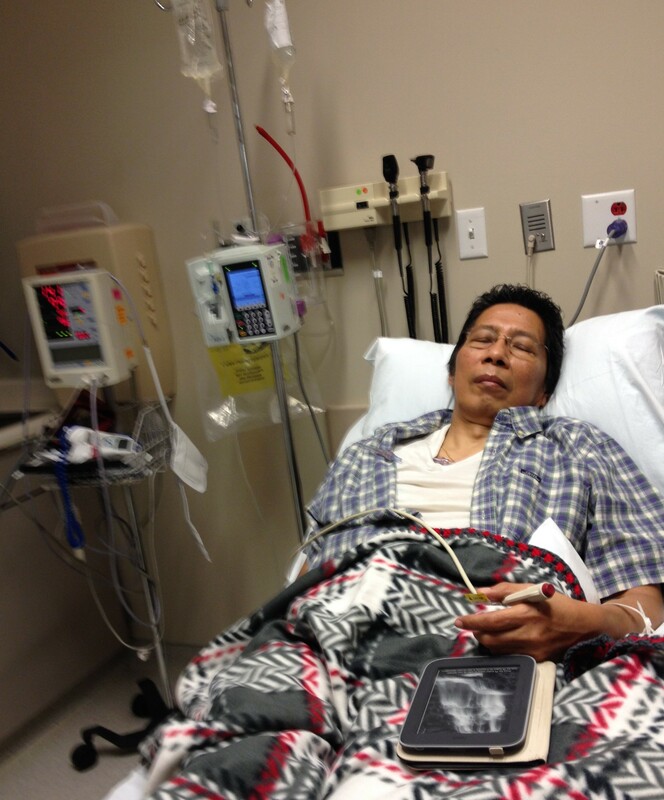 After two hours, the infusion was done a post infusion EKG test was done, then more vital sign checks and blood tests. They got so much blood from me that you would think Dracula is just outside my room sipping blood mimosa. Well the idea is to monitor the chemo toxicity in my body to determine the safe and effective level to administer the new drug. It was a long day at the hospital due to all the blood test requirements but I was glad it all went well. I was given instructions to report any changes or side-effects I experience from the drug. If any severe reaction happens, call 911. Whatever. For the next cycle, I am sure the dosage will be increased to see how I respond. Maybe next time I will come in as a mice or in a monkey suit with a number 5. Ha! P.S. I recovered from the first chemo cycle with only hiccups as a side-effect. I started my own experiment too to see if I can train for a marathon while doing the trial. Goal this weekend, another 10 miles.